Neil Gaiman's Journal: My Cheesy Goodbye! I had such a fun time blogging for the past two weeks, and I'm really, really glad that so many people enjoyed it! Dad did a book signing tonight and Doug and I went down to keep him company and tons of people said they loved the stuff I was doing. My father dearest also got a lot of e-mails from people we know as well as people we don't know, saying things like they really, really liked it, and that I was a great writer, and I should get my own blog! Well I'm glad you liked it, thanks for saying I'm a great writer, and no, I'm not going to get my own blog anytime soon so you should just keep reading this one and maybe I will pop up here and there. Keep a lookout for the Hellboy movie, and be sure to buy the DVD! Ok, I guess I should also thank everyone on the set that was helpful and were really kind! (Especially people whose middle or last names begin with "A", *wink wink,* you'll get it if I've talked to you about that...) Hungary is a great place and I hope I can come here lots in da future! 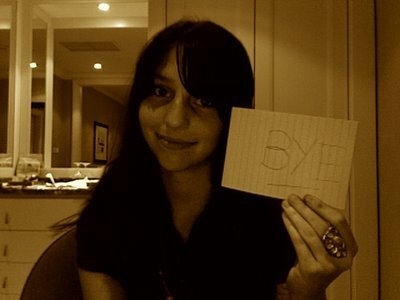 A picture of me saying goodbye! Sorry about the hand-writing... It's very sloppy because I had to write it backwards! Thank you soooooo much for reading this everyone.